Australian horseracing supporters got a last look at how their favourites for Auckland Cup Week perform at Ellerslie Racecourse last Saturday, although the rainy weather and slow going favoured the outsiders. Ellerslie will be back in full swing on March 04, when New Zealand Derby Day starts Auckland Cup Week with a bang that delights socialites, fashionistas and punters alike. New Zealand’s richest week in racing climaxes with the Auckland Cup on March 11, one of the most prestigious stayer events in the country’s racing history. Last Saturday saw both the Avondale Guineas and Avondale Cup run at Ellerslie. These Group 2 races allowed horses fancied for the Group 1 Derby and Auckland Cup to show off their form at Ellerslie over comparable distances. 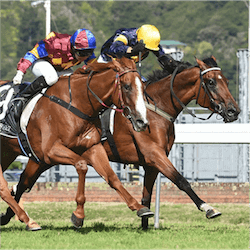 Run over 2100m, the Avondale Guineas is seen as a handy prep race at which to spot three-year-olds with the potential to win the 2400m Derby. Early Derby favourite Sacred Elixir came in a disappointing seventh, and trainer Tony Pike will have to get the gelding finishing stronger when he returns to Ellerslie next Saturday. Savile Row, after placing second in the 2000m Herbie Dykes Stakes at Te Rapa two weeks ago, did not run at Ellerslie. However, the colt is now ahead of Sacred Elixir in the Derby betting; they are first and second favourites at $4.50 and $5.00, respectively. Avondale Guineas winner Gingernuts has, not surprisingly, improved in the Derby betting; the gelding is currently being offered at $8.00 or less. That puts him level with Camino Rocoso, who ran eighth in the Guineas. Runner-up and third place went to Charles Road and Mongolian Wolf, and both are currently at $10.00 for the New Zealand Derby. Repeating his upset win in the 2016 Auckland Cup, 10-year-old gelding El Soldado made the most of the wet weather to romp home over 2400m and win the Avondale Cup. As a result, his Auckland Cup odds have shortened to $21.00, although Chenille is still the $4.50 favourite. If the going is rough on March 11, however, El Soldado has every chance of taking his second Auckland Cup in a row. But 2017 Wellington Cup runner-up Jacksstar, who finished sixth in the Avondale Cup, is also an outsider to watch in Auckland, at $14.00.